Gain a Powerful Recruiting Advantage. Make smarter people decisions with mobile recruiting solutions from Mobile Talent. Source, Qualify & Engage the right talent at the right time - faster. 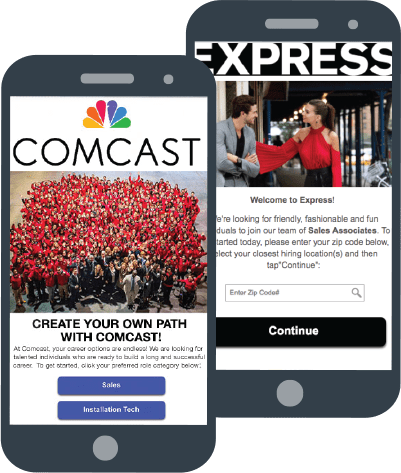 83% of Job Seekers are Mobile - Communicate anywhere, anytime for a better candidate experience, superior conversion rates and exceptional hiring results with our mobile recruiting software! Streamline job posting and increase sourcing conversion with simple, custom-branded mobile job sites that deliver measurable results. Ask us about Text2Apply to drive more targeted sourcing to your microsites. Prequalify and prioritize candidates with a brief, mobile-friendly questionnaire based on your hiring requirements followed by simple, automated lead scoring. Get better candidate response rates and maintain engagement with flexible SMS tools that balance personalization with efficiency. Take your recruiting to the next level using the latest Chatbot which leverages AI for more efficient, "intelligent automation". 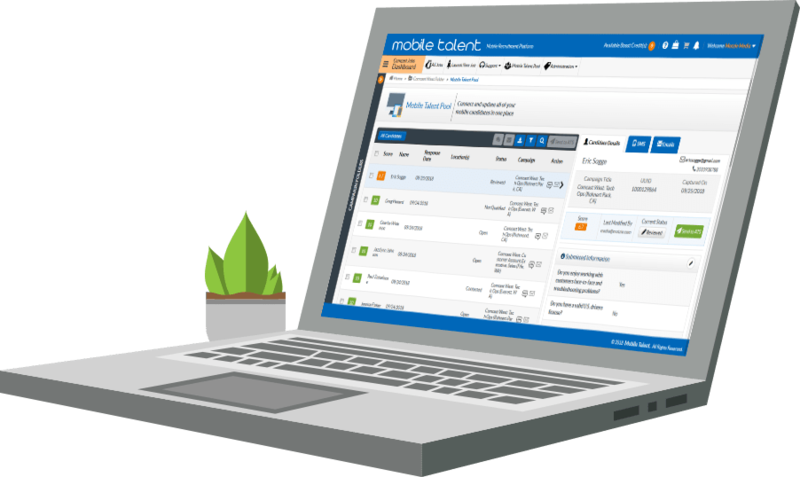 Mobile Talent's simple, customizable mobile microsites enable you to build and promote effective mobile sourcing campaigns in minutes. Grow your sourcing pipeline with our web based recruitment software and build a greater pool of qualified job seekers with a single click. Customizable candidate lead qualification and scoring features based on your criteria enables you to instantly filter your most “qualified” candidates. Now your recruiters can focus on higher level engagement activities to reduce hiring time and deliver a superior candidate experience. Your candidate connection begins the moment they submit their details so don't miss an opportunity to drive engagement. 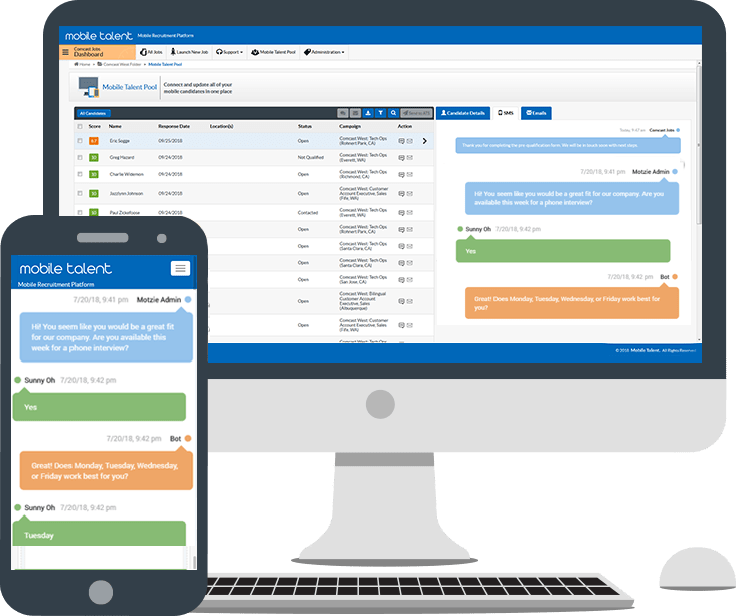 Our robust, secure SMS Communicator tools are the fastest, most effective way to instantly communicate with your top candidates and keep them engaged! Our Chatbot leverages AI and customization tools that enable even greater efficiency for you and your teams. The average candidate SMS message is read within 5 seconds. And, 98% of SMS messages are opened and read, vs. only 20% of email messages?